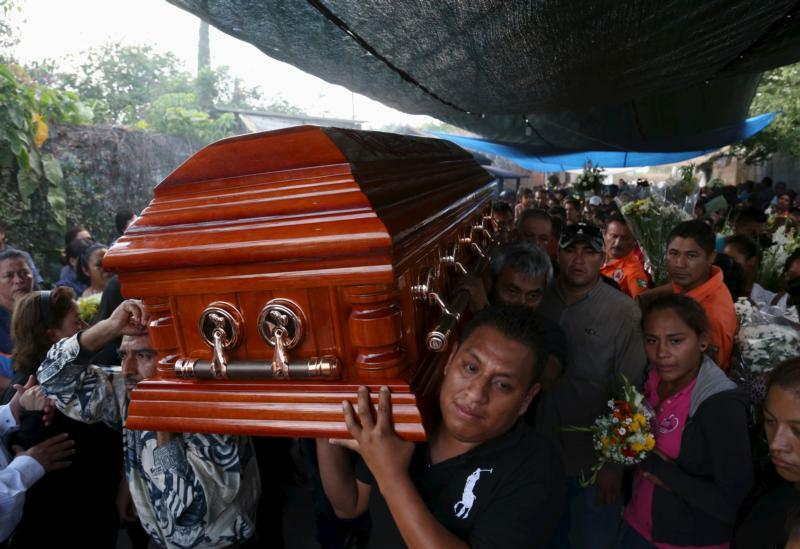 The coffin of Gisela Mota, former mayor of Temixco, Mexico, is carried out of her home Jan. 3. Mota was killed Jan. 2, one day after taking oath of office. (CNS photo/Margarito Perez, Reuters) See MEXICO-MAYOR-MOTA-CRIME Jan. 4, 2015. MEXICO CITY (CNS) — The assassination of a Mexican mayor the day after she assumed office was a message from organized crime and evidence of its influence in the area around the city of Cuernavaca, said the bishop who celebrated her funeral Mass. “How is it possible that all of a region of the state is in the hands of organized crime, that people are paying protection money,” said Bishop Ramon Castro Castro of Cuernavaca, in comments published by the newspaper Reforma. Authorities said Mota was murdered after assailants burst into her home Jan. 2, one day after she took the oath of office. Two of the suspects were subsequently killed in a shootout with police, while three more were arrested. The exact motive remains unclear, though Mota promised to clean up Temixco, a suburb of Cuernavaca. Morelos Gov. Graco Ramirez said the suspects belonged to a drug cartel known as Los Rojos. The mayor’s Party of the Democratic Revolution said at least 100 mayors in Mexico had been attacked over the past 10 years as criminal groups attempt to infiltrate and corrupt local governments. Former Mexican soccer star Cuauhtemoc Blanco — controversial for his on- and off-field behavior and a novice to politics — assumed office as mayor of Cuernavaca in late December, sparking a dispute with the state government over policing. Ramirez took to Twitter to blast Blanco for backing out of a scheme for putting all police in the state under a single commander, a concept promoted as an attempt to prevent police corruption. Blanco, who won the last mayoral race with less than 30 percent of the vote, said the scheme was not working. Bishop Castro has stayed out of politics and has promoted peace in the Diocese of Cuernavaca since arriving in 2013, although his work has not been without controversy. Before the June election, he organized a Walk for Peace that resulted in attempts at a boycott and buses from one parish being prevented from leaving.